How many people do you know who can support you on your social impact measurement journey? How many people do you know that you can support on their social impact measurement journey? 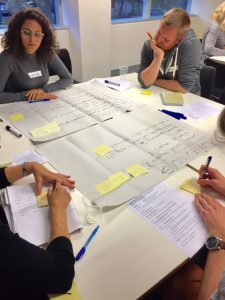 These questions got right to the point of why SIMNA as a network, is valuable for anyone concerned about social impact measurement, when Ric Dale, Chair of the SIMNA Coordinating Committee in Western Australia, asked them at the 2018 Social Impact Festival, organised by UWA Centre for Social Impact in late July. Speaking to a packed room of people attending the Festival’s two-day Social Impact Summit, Ric went on to explain how SIMNA activates opportunities for people to learn new skills; share knowledge and insights and most importantly, support each other in their journey with social impact measurement, whether they are just starting or are experts in the field. 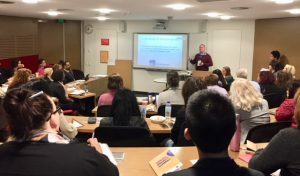 The core message delivered by Ric, that SIMNA is about purposeful, supportive networking, wasn’t the first time it was promoted at this year’s Social Impact Festival however, three days earlier SIMNA held a Social Impact Measurement Café. This workshop was part of the Festival’s ‘Impact Sparker’ program and provided 25 people with the opportunity to network, the SIMNA way. 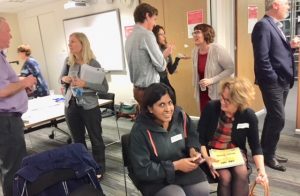 Focusing on doing social impact measurement, people attending the workshop introduced each other in a ‘who are we circle’ that set the supportive networking tone of the evening. This was followed by everyone nominating topics related to doing social impact measurement. From 18 topics three were finally selected for table discussions: measurement, cultural change, collaboration and engagement. Everyone self-selected into 3 tables to discuss one of these topics by focusing on Clarifying, Identifying Challenges, Creating Ideas. With an overall Facilitator supported by a Coordinator at each table, everyone was kept on track as they progressed through these focused steps for group discussion. Firstly, each group determined exactly what they understood their topic to mean, secondly they identified what they considered to be the biggest challenges, problems or issues associated with their topic. Thirdly, individuals at each table personally generated ideas to help deal with, or solve one or more challenges identified by their group. These ideas where shared and the whole table decided on 3 top ideas for possible actions/implementation. Overall 79 ideas where generated with many take-away possibilities for doing social impact measurement. After a good deal of sharing ideas and discussion, as with all SIMNA events in WA the evening wound up with networking over drinks and nibbles, another opportunity for SIMNA members and others interested in social impact, to support each other as they get on with doing, social impact measurement.